Recent news is that AquaBounty’s AquAdvantage transgenic salmon is on track to be approved by the FDA for sale in America. If approved, this fish could start appearing on your plate in the next couple of years. The DNA of the larger fish has been genetically engineered to produce growth hormones for its entire life. People who eat this fish will be eating this DNA, along with the growth hormones. Will reduce environmental impact on coastal areas and eliminate the threat of disease transfer from farms to wild fish due to being grown in land-based facilities. Will grow more fish with less feed. However, the Environmental Assessment on AquAdvantage salmon done by AquaBounty and presented to the FDA on April 25, 2010 could create a different picture. AquAdvantage eggs will be produced at a specific site on Prince Edward Island, Canada and flown to a specific site in Panama for grow out and processing before being sent to the US for sale. AquaBounty’s Environmental Assessment pre-supposes that they will always be in charge of the production and raising of their GE (Genetically Engineered) salmon. The feed to be used and its ingredients are not specified. What are the long term effects of AquAdvantage salmon on humans who consume it? Are there any residual effects from the antibiotics used to keep the fish disease free while kept in close proximity? 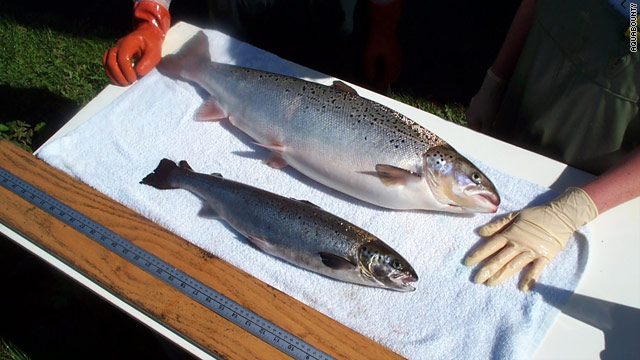 Does genetically engineered fish really relieve stress on wild salmon stocks? Does GE aquaculture fish truly offer a smaller carbon footprint compared to conventional aquaculture? Can AquaBounty guarantee that any future owner or lessee of their technology will abide by their production standards? Does it taste any good? What country of origin will be listed? At the fresh seafood counter, how will the fish be identified? What species? What is the real distinction here? We think that it is the inherently unique quality and taste that comes from a truly wild fish – a salmon that has lived out the course of its life feeding and living in its natural habitat – the open ocean. A GE aquaculture salmon presents the same issues and problems that have appeared in conventionally grown animal protein – with one addition. Under current U.S. law it will not be labeled as Genetically Engineered. Over the decades American consumers have sought to know what is in their food, where it comes from and how it was created. There should be no exception made for GE foods.